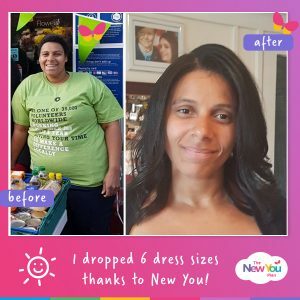 Since January of this year, customer Leila has gone from a size 24 to a size 12. She last weighed herself in June and by that time, she had lost a whopping 80lbs, but admits, it’s probably a lot more now. 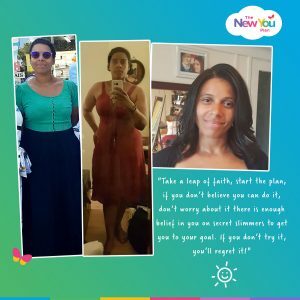 Choosing to focus on the number of dress sizes she’s dropped than weight loss, Leila takes a different approach, which is working extremely well for her. Faced with the prospect of having Bariatric surgery, Leila vowed to do it herself, and that she did! Leila, describe how you felt before you started the plan? I didn’t quite realise how fat I had become. I wasn’t always fat but due to health issues I more than doubled my weight in less than a decade. It took me ages to get stable enough to try and loose the weight. We grow all our own food so healthy eating wasn’t the issue. Portion size, cortisone and low metabolic rate were my downfall. 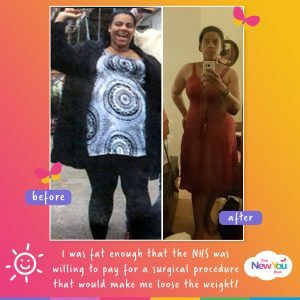 My GP asked me to consider Bariatric surgery and that’s when it hit me: I was fat enough that the NHS was willing to pay for a surgical procedure that would make me loose the weight. I got so shocked and offended by it that I wanted to prove to everyone that I could do it on my own, without the need for surgery. I came across the plan online after a quick search. I was instantly intrigued and inspired by how much weight others had lost so I decided to give it a go. It was now or never. 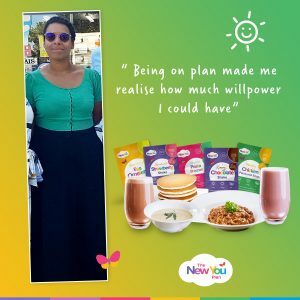 Being on plan made me realise how much willpower I could have. I must admit when I started I didn’t think I’d last this long. I’ve definitely surprised myself. Dee, my New You buddy keeps me on track, as does everyone in the wonderful community that is Secret Slimmers. 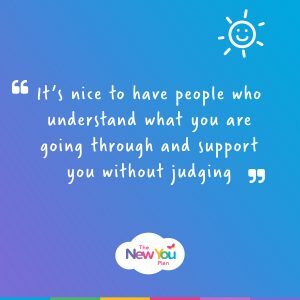 It’s nice to have people who understand what you are going through and who support you without judging. The moment I went into a shop and tried on a size 12 dress just to see how much work I still had to do to fit into it and it fitted! I couldn’t believe it! And now all my clothes are a size 12. Losing weight has helped me put the rest of my life into perspective. 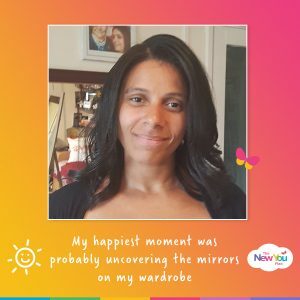 My happiest moment was probably uncovering the mirrors on my wardrobe. There are now mirrors in every room in my house, while before I would avoid them like the plague, not because I didn’t like what I saw in them but because the woman in the mirror wasn’t really me. People say I look much younger and actually a lot more relaxed. It’s as if stress was being kept inside these fat cells that went away, never to come back. I cannot live without the Chocolate Brownies or Cottage Pie. These are my favourites for sure. Take a leap of faith and start the plan. If you don’t believe you can do it, don’t worry about it… There is enough belief in you from the people in Secret Slimmers to help you get to your goal. If you don’t try it, you’ll regret it.